We call it “chuoi cau” in Vietnamese. I found that it suits the best for baking Western cakes than any other kinds of Vietnamese banana. The final product turns out well, not as dark as using other types of banana, smells greater and looks better than other types. In a small bowl, cover 200 gr sliced bananas with 30 gr sugar, lemon juice and wine. Set aside. In a large bowl, beat 230 gr bananas until smooth, use medium speed. In another large bowl, combine flour, cinnamon, 100-120 gr remaining sugar, baking powder, baking soda, salt, chopped cashew nuts. Use your whisk to mix them well. Mix the wet and dry ingredients together well. But do not overmix or your cake will turn out rubbery. 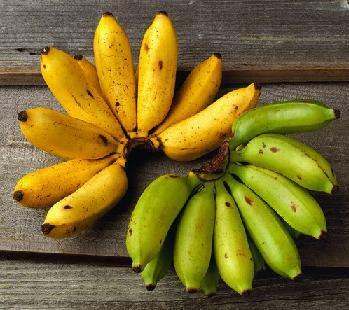 Fold in the bananas which is covered by sugar, lemon juice and wine. Pour the batter into 8″ loaf pan. Bake in 60-65 minutes or the toothpick comes out clean. Remove the cake from the oven and let it cool completely on the rack before sliced. Remember to let it cool before sliced! Alright, I actually never wait. I always eat the very first slice of my bread right after it’s done. Crispy outside and moist inside. Smell awesome! The bread can be stored at room temperature up to 3 days, if possible! Mine – 2 days the longest. Life is better with fresh baked cakes, or cookies! What’re you gonna do with leftover breads and overripe bananas? Last weekend I had 4 medium-size leftover loaves of bread and a lot of overripe bananas. After make some frozen banana ice cream (just banana covered by coconut milk, shredded coconut and chopped peanut – my most favourite childhood ice cream, Vietnamese style), I decided to make Vietnamese banana cake which is made from those 2 main ingredients. In a medium bowl, mix together bread, coconut milk, whole milk, eggs, flour (if any), salt. Set aside. NOTE: It’s easier if you crush the breads into smaller pieces. In a non stick loaf pan, mix together sliced bananas, sugar, Rhum wine, lemon juice until sugar covers bananas well. Place bananas in the oven in 10 minutes. Sugar is almost dissolved then. Remove the pan from the oven. Mix together the bread mixture and banana mixture. Add in vanilla extract and mix well. Pour the batter into a 10-inch round/square pan. Bake in 30-35 minutes or until the toothpick comes out clean. Remove the pan from the oven and let the cake cool completely in the pan before slice it. If you don’t use flour, the cake still has nice texture (as I did) and you don’t realize any bread crumb when you eat. It should be kept in the fridge up to a week (and it will get thicker then). Enjoy dear! Don’t waste any leftover food in your kitchen!